This is not a scientific analysis, but a philosophical one. There is not a lot of rigor in the definitions, and the various criteria ratings are much more a qualitative comparison between development patterns than actual quantitative analysis. Downtown serves as the regional business anchor. There has always been a variety of uses downtown including retail, office, industrial, recreational, religious, government, medical, and residential. More recently, there has been an effort to increase the residential component. Population diversity downtown includes the poor/homeless and the upper-middle income to wealthy. There is not a whole lot of opportunity for the lower-middle income resident to own or rent in the downtown area. Historically, streetcar lines radiated from downtown and provided public transportation to get workers from their homes in the surrounding neighborhoods to their jobs at the center of the city. Now, buses are the primary form of public transportation, but added to that are a gridded road system (cars), a trail system (bicycles), and a shuttle system within downtown. The downtown area is compact for the most part, with plenty of public space in the form of streets and parks. I would go so far as to say there may be too much open space... certainly too many surface parking lots. As land values increase in the core, surface parking lots will disappear. Most older cities constructed prior to the explosion of automobile ownership were built around a "walking" module, with commercial streets forming a grid and residential areas filling in the spaces between. Retail stores populated the main streets, often with residential apartments above. Such districts were to a large degree destroyed in favor of auto-oriented strip malls and drive-thrus in the post-1940's suburban expansion. Some pockets of mixed-use pedestrian districts remain: Beaverdale business district, a block or so at Euclid and 6th, portions of Ingersoll, and University Ave at Drake. East Village is in the process of being remade as a mixed-use pedestrian district. The population "watershed" for a mixed-use pedestrian district should include several blocks on either side because residents can easily walk to the businesses. Including this additional population allows the diversity of such a district to increase greatly. Not only can it include low-rent apartments above the shops, but also pricey single-family homes within walking distance. Such a district promotes frequent contact between people of different income levels. Such districts are typically compact and connected through public transportation to other similar districts and to downtown. A walkable neighborhood contains a variety of housing options, but is not centered on a pedestrian commercial street. Though a gridded street pattern is present, it is less likely that residents are within a just few blocks of retail or frequent public transportation. An example of such a neighborhood might be Union Park. Such a neighborhood can support a relatively diverse population, but the diversity of use begins to drop when retail and businesses are relegated to the edges. A mix of single-family homes and apartment buildings helps keep the density relatively high. Particularly in historic walkable neighborhoods, there is an excellent sense of the street and sidewalk as a "public realm" where spontaneous interaction can occur. Diversity in use and population decrease significantly in a suburban subdivision - they are typically planned and constructed as uniform, stable environments where one purchases a sense of stability as well as a house. Homeowner associations and restrictive covenants in suburban subdivisions are sometimes implemented in an attempt to preserve this stability. Non-conforming uses are usually not present in subdivisions. Connection and compactness decrease as well. Because a suburban subdivision typically consists of relatively uniform lots and primarily similar residential units, street patterns and lack of connection make it difficult to provide effective and meaningful public transportation. The public realm is difficult to define in a suburban subdivision. Often, those elements like streets and parks that are typically considered public are actually less than such. These "public" goods are in many cases actually owned and maintained by the developer or homeowners' association rather than the local government. While the difference may be negligible to a resident of the subdivision, it means that use can be restricted and rules can be enforced that might not otherwise be allowed. Indeed, there are gated suburban subdivisions surrounded by fences, where it is impossible for non-residents to enter without approval. This is the antithesis of public space, and serves to drastically reduce diversity. Given the almost rural location, small developed pockets outside of suburban subdivisions are difficult to define. Some were constructed in a relatively rural setting before the suburbs. Others were constructed after and in-between subdivisions to take advantage of new infrastructure without the subdivision restrictions. Either way, they are probably somewhat more economically diverse and support more diverse uses (wholesale/retail, agricultural, service, and residential), though at very low densities. Connection is very low, consisting primarily of rural routes, state highways, and small feeder roads. There is very little public space except for roads, and they make up a relatively small percentage of the overall space. The rural development pattern is included here primarily as a comparison. Connection is extremely low, and there is literally no public space (excluding state parks from the calculation). Racial and economic diversity are relatively low, with relatively few wealthy people compared to highly urbanized areas. Great idea - thanks for your input! I've been thinking more about this diagram and I'm glad that you didn't include density or cost in the paradigm. In my opinion both are product of demand, which is driven by amenity aka the factors you have highlighted above. Density of development is merely a response to having connectivity, a compact and walkable neighborhood, diversity of uses ie diversity of restaurants, jobs, housing, etc... which incidentally is WalkScores next endeavor to improve their metric. Density is a relative term. There are suburban apartment complexes that are much more dense than the neighborhood I live in, which is much more "urban". That's why I tried to distill the abstract idea of urbanity down to those key elements that differentiate what I see as "urban" from areas that are clearly not. Sorry to keep pestering you, but I think there is something really profound here, but it just has to be elucidated a bit. You are right that density is relative. There are good forms of density and bad forms. In my opinion, the bad density is a product of a real estate delivery and city building system that has lost its way. Where there should be a direct relationship between amenity and value/density, which is what your diagram shows, and how we know infrastructure and development at least SHOULD exist, there is not a direct relationship in what we might label as the 20th century city for shorthand. In fact, there is no relationship or guiding force. In many cases, it is delivering density where it doesn't want to be (and getting slums) or not correctly identifying the barriers to why density ISN'T happening in areas that have levels of amenity like high connectivity, etc. I am still struggling with the two diversities, I guess. These strike me as outputs or resultant products of various forces rather than the inputs. I think this can get really strong if we're able to distill a similar diagram strictly to inputs. I guess the challenge with that is the feedback loops inherent in complex systems such as cities. I'm wondering, are there more elements to this equation? If so, what might they be? Or are there less, and they all revolve around connectivity and its various permutations? Sorry to keep pestering you, but I think there is something really profound here, but it just has to be elucidated a bit. This type of discussion is one of the reasons I enjoy blogging! I think I see now what you have been getting at - let me try to respond and see if it moves the discussion forward. You are right that density is relative. There are good forms of density and bad forms. In my opinion, the bad density is a product of a real estate delivery and city building system that has lost its way. "Bad" density can be bad for two reasons: socioeconomic and form. Having studied both architecture and social work I have taken some opportunity to explore each. I have come to the conclusion that the physical form of density can be an aggravating factor, but ultimately is not the determining factor in the fundamental character of a specific "dense" development. Indeed, I consider the characteristic suburban apartment complex form just as disagreeable as the characteristic mid-century public housing form. The difference becomes primarily socioeconomic and political. Perhaps when we are discussing urbanity as a concept, the definition of density should not be related to number of inhabitants but rather something like "layers". A densely "layered" (hence "urban") neighborhood might be one that consists primarily of single family homes, scattered apartments, a connected street grid, variety of income levels, an active public realm, integral commercial streets, and effective transportation connections to adjacent neighborhoods. Such a neighborhood might also be "dense" in the sense of being highly-built, and may also have high property values, but would not need these characteristics to be "urban". Neighborhoods at either end of the value spectrum seem to also exhibit less socioeconomic and racial diversity than those within a couple standard deviations of average. The diversity elements are most certainly more subjective than the others. I think perhaps I included them simply because I feel more "urban" when I am in places that people different than me also enjoy being. There is an intangible energy in a mixed-use commercial district like the Delmar Loop in St. Louis with a diverse population of inhabitants and users. If I had to lose one of my elements, I suppose it would be this one. There are many examples of "urban" places that have relatively homogeneous populations. What they lack to me is a general feeling of being urban in a good way. The new "lifestyle center" development concept that tries to emulate a vibrant mixed-use district by fabricating density and diversity of use feels antiseptic to me because they tend to fail at also producing a diversity of user. To borrow from Howard Kunstler, places created to be cartoons of actual successful places may be both dense (in the traditional sense) and valuable (in an economic sense) but fail at being urban. 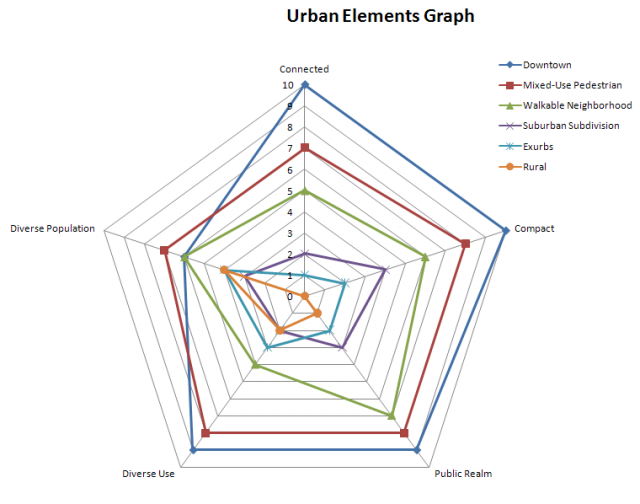 I think that diversity of use is most definitely a defining characteristic of urbanity as opposed to suburban or rural. Thank you for a lively and challenging discussion!